We are top specialists at Thermador appliance repair, installation, and maintenance. If your Thermador refrigerator, freezer stove, cooktop or any other appliance brakes, we can help. Our technicians are factory trained and certified to do repairs on Thermador. We work on all the models both newer and older. Our company can get you any Thermador parts that you might need and will expertly install it. We know every aspect of Thermador appliance repair, and we guaranteed you total customer satisfaction. Nobody can do a more thorough and professional repair job than us. 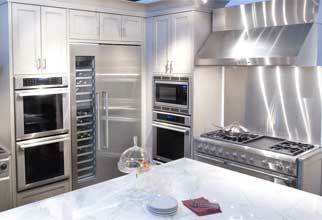 Thermador makes excellent, high grade, and innovative appliances. They use the latest technology and customization to make their devices both stylish, user-friendly and useful. But all that technology is brakes and sometimes it is quite expensive to fix. You need a professional appliance repair company to do the repair and maintenance job for you. We are that company. We will find best and cheapest way to get the job done. Our team will get the genuine Thermador parts for you at the lowest prices possible. Our technicians will stall them right the first time around and will give you tips on how to maintenance your appliance. You broken Thermador appliance will be as good as new in no time. Besides having outstanding skills and knowledge about Thermador appliance repair we also offer you some of the best customer services around. We make appliance repair an easy and no hassle experience. Our technicians are always polite, respectful and friendly. They will go out of their way to make our customers happy. Our call center provides you with flexible scheduling. We offer accurate estimate and FREE service call with every repair job. We are very upfront and reasonable about our pricing. And we are so sure of the genuine, high-quality parts that we provide that we give you a 3 yearwarranty on all the parts. Give us a call, and your broken Thermador appliance will be functional once again! Our company, Top Home Appliance Repair has been in business for more than 30 years. We have always served our neighbors in Los Angles, Ventura County, and East Bay. With two offices we are always able to be where we are needed. Our company is family owned, and family runs. We repair all major home appliances such as refrigerators, dishwashers, washers, dryers, stoves and ranges, ovens, steam ovens, microwaves, freezers, ice makers, BBQs, pizza ovens, patio heaters and much more. We do both residential appliance repair and commercial appliance repair. Call us for all of your appliance repairs needs. For Thermador appliance repair give us a call of fill out our short contact form. We will arrange a convenient repair appointment for you. Our call team will get as much info as possible from you about your broken appliance, and we will give you a accurate estimate based on this. We will preorder the parts that we expect you might need. Our qualified technician will be on your way to your place in no time. He will bring with him all the tools and equipment needed for your particular job. Once we are at your house, he will quickly diagnose your appliance and get to work. We work fast because we know what we are doing. And we detail oriented because we want to do the job just perfect the first time around. Before you know it, your appliance will be back in working shape. After the job is complete, our technician will clean up after himself and dispose of all the broken, old parts. He will plug in your appliance and do all the safety checks. When working with gas or electricity, you can never be too safe. Once your appliance has passes the safety tests he will turn it over to you. You Thermador appliance will be perfectly functional and safe to use. With our expert repairs, we expect for your appliance to work for a long, long time without breaking. If you want a total peace of mind, your can order our annual or bi-annual maintenance program to our customers. It covers all appliances in your kitchen and laundry. As a part of this program, our technicians will do all the maintenance for you on a regular basis. They will inspect your appliances every time and catch any problems before they become significant. This maintenance service will save you time and money. Why choose us to do Thermador appliance repair for you? We are the most qualified and experienced company out there. We know everything there is to know about Thermador appliances from the oldest models to the brand new once. 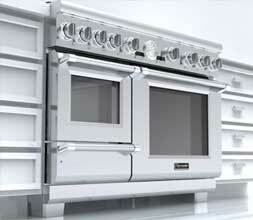 Top Home Appliance Repair can repair anything in your Thermador kitchen. Our 30 plus years experience gives us enough experience to handle any level of work. No project is too big for us. Our techniques are certified by Thermador and are up to date on the latest appliance technology. We also offer you no hassle, easy appliance repair experience. Our team is friendly and helpful. They will come at the time most convenient to you and will not disturb your or your household in any way. They will just do the work and clean after themselves. With our company, you can be sure that the job is done right the first time. For Thermador appliance repair, please call us at 818-855-7988 in Los Angeles and Ventura County or 925-265-7782 in East Bay. Or you can fill out our short contact form. We would love to talk to you and answer all of your questions. Besides Thermador appliance repair are also certified to repair Asko, Bertazonni, Bosch, Dacor, DCS, Electrolux, Fisher&Paykel, Frigidaire, GE, Jenn-Air, KitchenAid, La Cornue, LG, Liebherr, Marvel, Miele, Perlick, Samsung, Siemens, Sub-Zero, Traulsen, True, Viking, Whirlpool, Wolf. We are top specialists at Thermador appliance repair, installation, and maintenance. If your Thermador refrigerator, freezer stove, cooktop or any other appliance brakes, we can help.